South of Akureyri is one of the towns most popular outdoor areas - the woodland Kjarnaskogur. The recreational area is approx 600ha with more than 1 million trees of many species planted within the last 50 years. The area has over 12 km of gravel paths, in addition to a vast network of back country trails. During winter and nighttime 7 km of the paths are lighted. The area has about 10 km long designated mountain bike trail which is connected to the Mt. Hlíðarfjall mountain bike trail. The area has several playgrounds, picnic areas, barbecue facilities, restrooms and four volley ball courses as well. For bird lovers, the area is rich of birds and by the marshland in the north of the area (by Hundatjörn in Naustaborgir) there is a bird watching shelter. A campsite is nearby, Hamrar, with easy access to the forest. To drive - Head south from the town along the fjord road no. 823, pass the airport and turn right by the sign "Kjarnaskogur" and follow the road up to the parking area. To walk - Walk along the seafront path (along road no 823), pass the airport and turn right by the end of the airport area, by the sign "Kjarnaskógur" and continue up to the woodland paths. 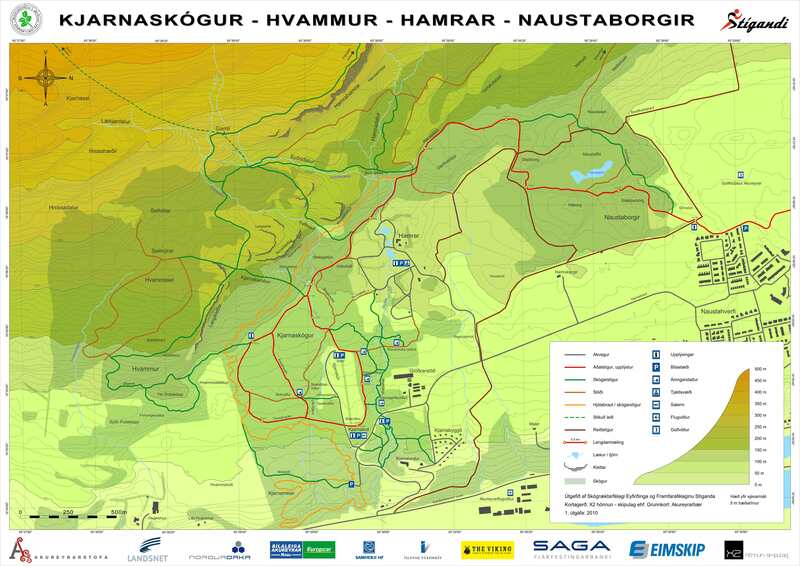 Also possible to take bus number 1,2 or 5 from town square, Ráðhústorg, and go out at Kjarnagata/Vallatún, by the golf course. From there is about two km. walk to Kjarnaskógur area.